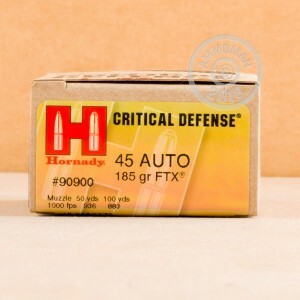 When a self-defense situation occurs, count on Hornady Critical Defense ammunition to keep you safe. Critical Defense cartridges are built around the FTX bullet, a jacketed hollow point design with a soft polymer tip that fills the expansion cavity and keeps debris clear of the unfolding petals. This preserves the projectile's ability to quickly incapacitate an assailant. 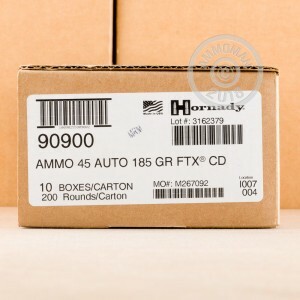 Each .45 ACP cartridge in this case of 200 fires a 185 grain version of the FTX bullet at a muzzle velocity of 936 feet per second. The use of a light bullet allows for improved velocities and expansion potential without increased recoil; this ammo will work well in compact carry guns as well as full-size firearms like the SIG P220 and 1911. 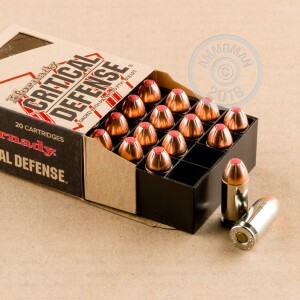 Pick up this 200-round case of defensive ammo or any other items totaling $99 or more at AmmoMan.com to get free shipping!